WEKI is focus on providing quality products with competitive price. We will always provide the best product, pre and after service,.Assured quality. If for any reason you are not satisfied,please feel free to contact us to give us a chance to solve your concern.Just keep in mind that we care about every customer. This remote will have to be reprogrammed .This key fob need to be programmed at your local dealer or car locksmith.Blade also need to be cut. 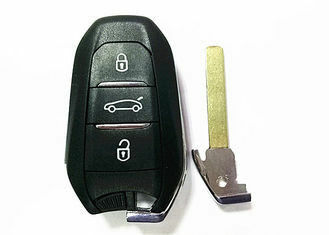 This Peugeot remote will only operate on vehicles already equipped with a factory keyless entry system. All controls include a battery, are tested before shipped . Other kinds of the keys like it ?